This small rural village is located 15 kilometres south of Gorey in County Wexford. 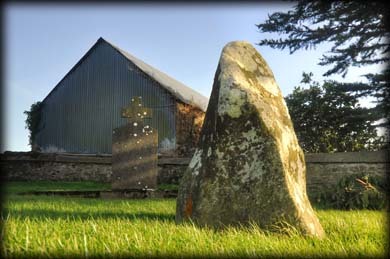 In the southeast of the Church of Ireland graveyard, associated with the Parish church of Monamolin, is a small standing stone. 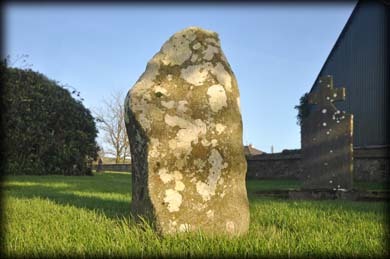 The stone is one metre in height with a triangular profile when viewed from the north and south. The village name comes from the Irish, Muine Moling. St Moling founded a monastery at St Mullins in Carlow and was also the second Bishop of Ferns. St Molings well is about 350 metres south of here. Situated: From Gorey head southeast on the R741 (Ballycanew Road). After 14 kilometres turn right for Monamolin. At the crossroads turn right and follow the road to your left. The church is on your left. Discovery Map 69. T1195 4629. Last visit Jan 2015.